WASHINGTON, Aug 22 2012 (IPS) - Following Monday’s announcement of the death of long-time Ethiopian leader Meles Zenawi, Ethiopian civil society leaders and Western rights groups are characterising the turn of events as an opportunity to heal decades of increasingly stark sectarianism. Many are also pointing to the U.S. government’s potential role as key. “Meles’s death has created an opportunity for peace in Ethiopia, meaning that this transition should not be business as usual,” Getachew Begashaw, a professor of economics at Harper College here in the U.S., told IPS. The potential for sectarian violence has been a top concern for those attempting to plan for the death of the Ethiopian leader, who had been sick for several months. Meles ruled with an increasingly authoritarian fist for more than two decades, and many worry that his absence could leave a political vacuum. Still undetermined is the impact that Meles’s death will have on ongoing negotiations between Sudan and South Sudan, as well as in Somalia, talks in which the Ethiopian leader has provided leadership. Currently, however, the focus for many is on more immediate concerns. For all the talk about Ethiopia’s recent economic revival, many warn that this development has yet to reach the vast majority of the country’s population. Instead, much of this wealth – and political power – has been retained by the ruling party and, particularly, by the tiny Tigrayan minority community to which Meles belonged. Already Meles’s deputy prime minister, Hailemariam Desalegn, has been put forward to rule until elections can be held in 2015, although a meeting of Parliament to make this move official, slated for Wednesday, was suddenly called off. 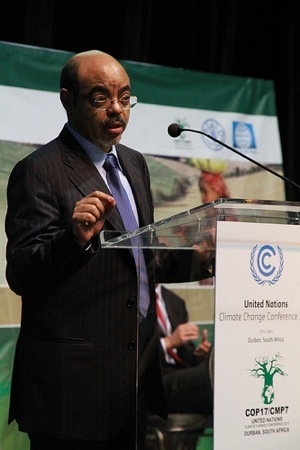 “Meles Zenawi’s whole policy was based on short-term interest – what’s good for him, not what’s good for his nation. Today, Ethiopia is more divided today by ethnicity than ever, and that is his fault,” Obang Metho, executive director of the Solidarity Movement for a New Ethiopia, based here in Washington, told IPS. Metho and others particularly emphasise the role of the United States in the upcoming transition. The two have a long and contested relationship, as Washington has funnelled huge amounts of military and development aid to the Meles regime, particularly following the start of the US-led “war on terror”. Today, the United States continues to run unmanned aerial “drone” flights out of a base in Ethiopia. The U.S. also continues to provide significant humanitarian aid to Ethiopia, which currently brings in more foreign aid than any other country in Africa. Landgrabbing in Ethiopia: Legal Lease or Stolen Soil? “The United States must seize this opportunity to recalibrate its relationship with Ethiopia and help to build strong, accountable institutions and respect for the rule of law, lest it risk…a relationship with yet another ‘strongman’ and depend on the luck of the draw over his longevity,” Amnesty International said in a statement Tuesday. The International Crisis Group, in a report released Wednesday, similarly called on the United States, in concert with the U.K. and E.U., to “seek to play a significant role in preparing for and shaping the transition”, especially by working to strengthen capacity within the opposition. While the initial U.S. response , including condolences from President Barack Obama and Secretary of State Hillary Clinton, merely commended Meles for his role in strengthening Ethiopia’s democracy and economy while also noting his efforts in the civil war in Sudan, subsequent days have seen a slight shift in tone. Strengthening the opposition and loosening the reins on civil society generally is particularly important, Begashaw said, in turning away from the spectre of potential ethnic strife in a post-Meles Ethiopia. He said the United States needs to play a role as a “credible peace broker between the opposition and the ruling party”, ensuring that the country’s politics open up, that political prisoners are released, and that organisations outlawed by Meles on grounds of “terrorism” are reinstated. Still, others suggest that the remnants of Meles’s regime remain so strong that there is little reason to expect an outbreak of violence anytime soon. “The ruling party is so dominant that I seriously doubt that there will be internal turmoil. They control 99 percent of the seats at the federal, regional and local levels,” a former U.S. official and Horn of Africa expert told IPS on condition of anonymity. Metho hinted that incorporating the ruling regime could well prove to be an important part of the opposition’s strategy. Human rights and free speech are notions that have been used as political tools to cover up the true motives of oppositions which is one of a lust for power. Let me just quote a comment from a Swedish newspaper that precisely puts my outlook on the issue. It was in response to Mesfin Negash’s article on the issue of aid and free speech. (will share the source later) “There are other people also in Ethiopia apart from journalists. Millions of people that are poor, extremely poor, who can’t eat democracy and human rights. What they worry about is where they should find there next meal. Looking at the present government and their record on development, people are actually seeing the country developing rapidly and poverty reduction is taking place. Much could be discussed about the details of that progress, but the country is actually making headway (not driven by oil) and whether the external aid contributes to that growth is also difficult to give a straight answer to and a discussion in itself. But to regard aid and development cooperation as justified only when a country meets standards that journalists perceive as criteria for cooperation with other counties is a bit naive. And if that is just naive, the implied assumption that no one says anything to the Ethiopian government about the situation for human rights and democracy is quite ignorant and arrogant. I don’t think any of the countries you mention that provide aid to Ethiopia approve of the human rights situation or all aspects of its democracy, and they do try to influence the government. The question is: how do you influence a goverment on these issue? By reducing aid? Should we (Sweden) stop trading with China or any other state we have development cooperation with because of their human rights record? Or stop travelling to USA, because the country have states that still have the death penalty? You are right that there is no positive automatic correlation bewteen democracy and development. It is actually so that democracy and human rights follow development, rather than the other way around. That’s the experience around the world. There are plenty of examples of that process in Africa. It does not mean that one should not try to work to improve human rights and democracy, but the means to do that needs to be more fine tuned than just stop giving aid because there are incidents of transgressions of human rights. Why don’t you come with some suggestions of how Sweden could support press freedom in Ethiopia? I just want to comment on the way the Ethiopian people are treated here in Kuwait. The ethiopian woman is treated bad and if you are in the posistion to help them you should. then they are caught and put in a camp (prison) and that is where they stay until they die.Or until they agree to become prostitutes.I will sponsor as many as I can to help send them home the plane ticket for one person is 65KD. Someone in a higher posistion to help need to check into the civil rights of the ethiopian people in Kuwait. And other races.